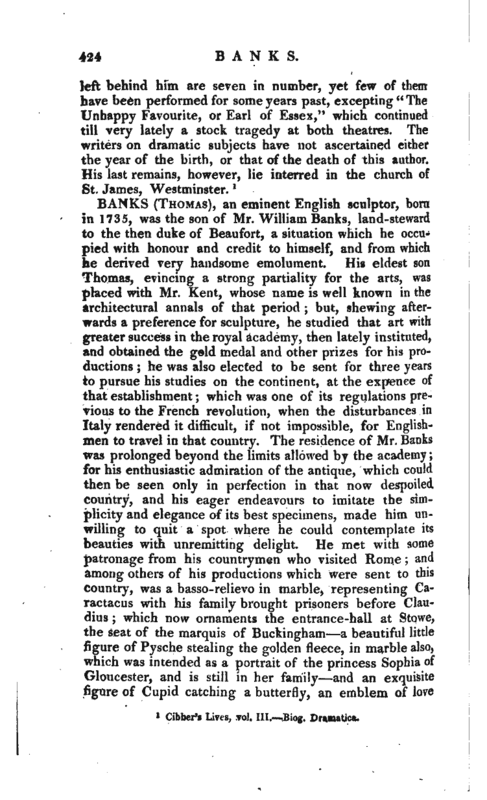 , an eminent English sculptor, born in 1735, was the son of Mr. William Banks, land-steward to the then duke of Beaufort, a situation which he occupied with honour and credit to himself, and from which he derived very handsome emolument. His eldest son Thomas, evincing a strong partiality for the arts, was placed with Mr. Kent, whose name is well known in the architectural annals of that period but, shewing afterwards a preference for sculpture, he studied that art with greater success in the royal academy, then lately instituted, and obtained the geld medal and other prizes for his productions he was also elected to be sent for three years to pursue his studies on the continent, at the expence of that establishment which was one of its regulations previous to the French revolution, when the disturbances in Italy rendered it difficult, if not impossible, for Englishmen to travel in that country. The residence of Mr. Banks was prolonged beyond the limits allowed by the academy for his enthusiastic admiration of the antique, which could then be seen only in perfection in that now despoiled country, and his eager endeavours to imitate the simplicity and elegance of its best specimens, made him unwilling to quit a spot where he could contemplate its beauties with unremitting delight. He met with some patronage from his countrymen who visited Rome and among others of his productions which were sent to this country, was a basso-relievo in marble, representing Caractacus with his family broughtprisoners before Claudius which now ornaments the entrance-hall at Stowe, the seat of the marquis of Buckingham a beautiful little figure of Pysche stealing the golden fleece, in marble also, which was intended as a portrait of the princess Sophia of Gloucester, and is still in her family and an exquisite figure of Cupid catching a butterfly, an emblem of loye | tormenting the soul, the size of life, which perhaps for grace, symmetry of form, and accuracy of contour, has scarcely been equalled by a modern hand, and might almost vie with those productions of the ancients, to which his admiration, as well as emulation, had been so constantly directed. Finding, at length, that it was impossible on the Continent to meet with that patronage which, with just ambition, he aspired to, he determined on returning to his native country from which, however, he was soon after again enticed, by very favourable prospects held out to him by the court of Russia, whither he repaired, taking with him the above-mentioned figure of Cupid, which was purchased by the empress Catherine, and placed in a temple constructed for the purpose in her gardens at Czarscozelo. After a residence of nearly two years, in a climate which proved very destructive to his health, an,d disappointed in his hopes, he returned to his family in England, there to wait the tide of favour, which was not long in turning its course towards him. In that branch which the profession of a sculptor chiefly embraces, that of monumental subjects, there is not so much scope for fancy and variety, as in the productions of an historical painter, but whenever an opportunity offered of deviating from the established rules usually adopted in these cases, our artist did not omit to avail himself of it, of which there is a striking instance in a monument to the memory of a daughter of sir Brooke Boothby, in Ashbourne church. 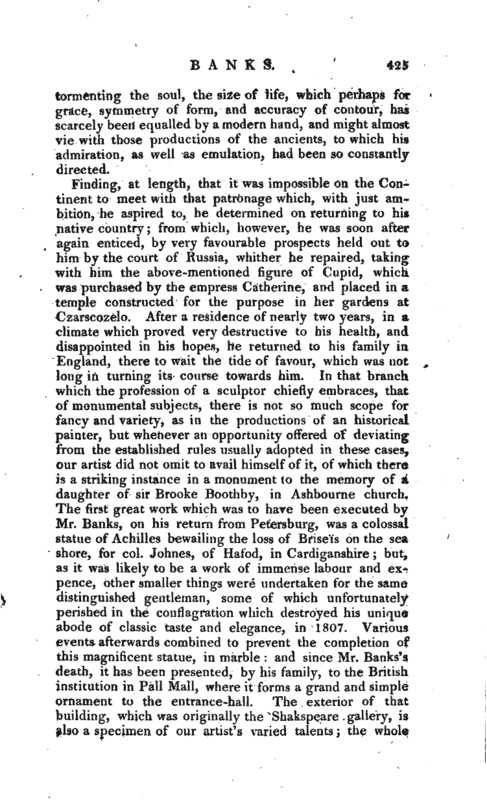 The first great work which was to have been executed by Mr. Banks, on his return from Petersburg, was a colossal statue of Achilles bewailing the loss of Brise’is on the sea shore, for col. Johnes, of Hafod, in Cardiganshire but, as it was likely to be a work of immense labour and expence, other smaller things were undertaken for the same distinguished gentleman, some of which unfortunately perished in the conflagration which destroyed his unique abode of classic taste and elegance, in 1807. Various events afterwards combined to prevent the completion of this magnificent statue, in marble and since Mr. Banks’ s death, it has been presented, by his family, to the British institution in Pall Mall, where it forms a grand and simple ornament to the entrance-hall. The exterior of tnat building, which was originally the Shakspeare gallery, is also a specimen of our artist’s varied talents the whole | front of it having been designed by him, as well as the beautiful groupe of figures over the entrance, which are allusive to its original destination. In the latter years of Mr. Banks’s career, his monument for sir Eyre Coote in Westminster abbey, and those in St. Paul’s to the memory of the captains (Hutt, Westcott, and Rundle Burges), who fell in some of our great naval victories, are the most conspicuous and, as they are within the reach of general observation, may be duly appreciated by persons of taste. Mr. Banks’ s election to be one of the members of the royal academy took place not long after after his return from Russia. 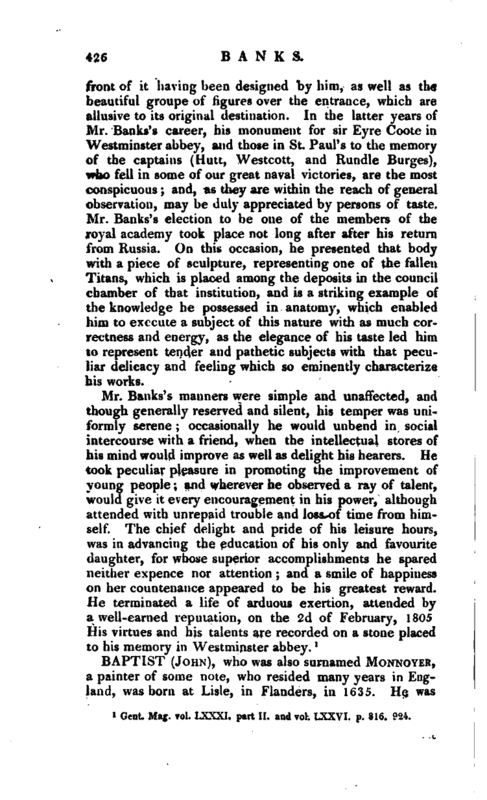 On this occasion, he presented that body with a piece of sculpture, representing one of the fallen Titans, which is placed among the deposits in the council chamber of that institution, and is a striking example of the knowledge he possessed in anatomy, which enabled him to execute a subject of this nature with as much correctness and energy, as the elegance of his taste led him to represent tender and pathetic subjects with that peculiar delicacy and feeling which so eminently characterize his works. Gent Mag. vol. LXXXI. part II. and vol. LXXVI. p. 816; 924.